Experience marine life on the sides and overhead through a tunnel. Goliath Groupers can weigh up to 700 pounds. View hundreds of fish as they swim in what's called a "bait ball" from underneath the tank. Hunters and anglers are honored for their conservation efforts throughout WOW. The aquarium makes up about half of Wonders of Wildlife and has 1.5 million total gallons of water. This exhibit aims to showcase the hard realities of the wild. Bass Pro Founder Johnny Morris addressing media during a tour of WOW Sept. 19. Bob Ziehmer (left of Morris), is Bass Pro's director of conservation. The first stop for visitors is through an exhibit dedicated to Native Americans, the first conservationists. Former President Jimmy Carter speaking at Wednesday's ribbon cutting ceremony. Former President George W. Bush speaking at Wednesday's ribbon cutting ceremony. Prior to Wednesday's ceremony, actor Mark Walhberg stopped by to tour WOW and take a dive in the Shipwreck yard tank. Mark Walhberg diving at WOW Wednesday. Upon concluding the 1.5 mile weave through its immersive wildlife and marine exhibits, you understand why Wonders of Wildlife, or WOW, took nearly 10 years to complete. Attention has been paid to every inch of this 350,000 square foot complex at the corner of Campbell and Sunshine in central Springfield. From its sounds and lighting to each room’s temperatures and even smells, WOW is a work of art. “This is telling the story – the history of our nation. It’s telling a story of the beauty and the grandeur,” says Rob Keck, WOW’s board chairman. The murals that make up the backdrop in the Africa exhibit took artists 1 year to complete. Each wildlife diorama - and there are easily 100 throughout the complex - portrays animal species in their natural habitats. 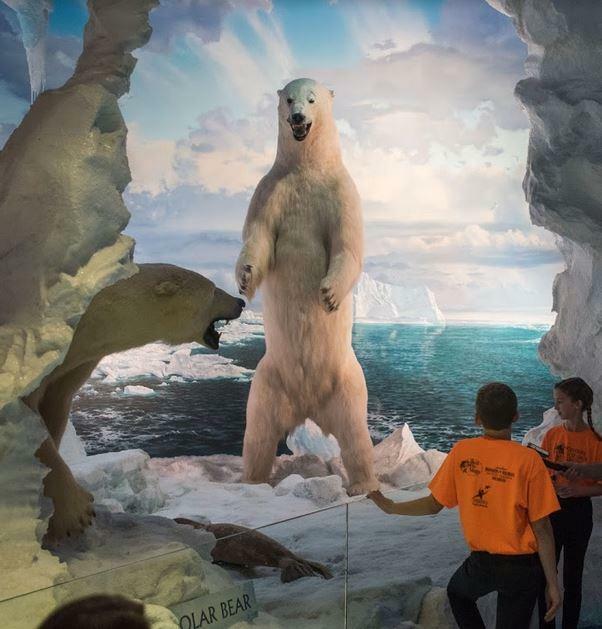 Three-dimensional taxidermy elk, bear, lions, elephants and more are accompanied by depictions of trees and plants, and hand-painted mural backdrops that transport you to the plains of the Dakotas, the peaks of Mount Olympia, or to view the northern lights in the Arctic Circle. Artists have been working on these displays for years, according to Michael Zerman, Bass Pro’s senior communications manager. “The Wolken brothers [Adam and Aaron] have done a lot of the mural work in the museum and aquarium, and they spent over a year in Africa [exhibit] alone,” says Zerman. Go on safari to witness zebra, wildebeest, aardvark, and the giraffes overlooking it all within the African section that stretches two stories tall. Hear the swirling winds of the arctic and view its inhabitants, plus get a sense of the harsh realities of the wild through an encounter between musk ox and wolves. 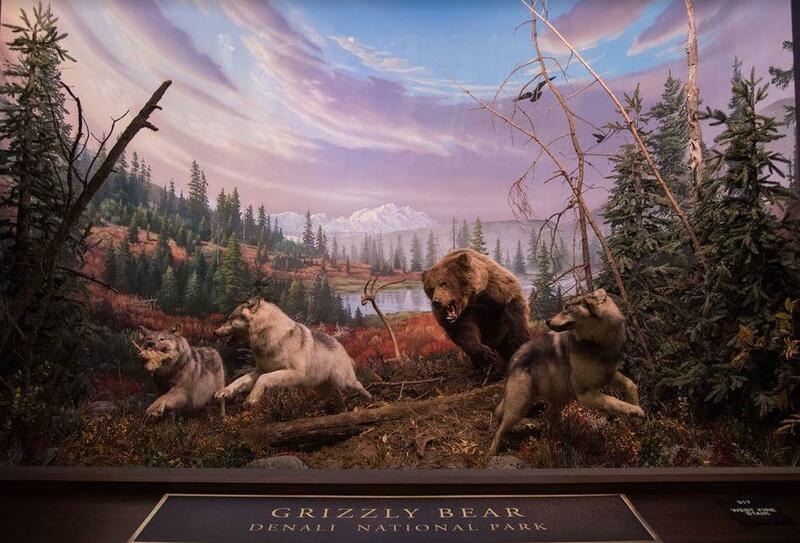 There are easily 100 dioramas located throughout the Wonders of Wildlife National Museum and Aquarium. Trek through the Himalayan Alps and the land of mountain sheep, and learn how efforts in the United States and Canada saved the Big Horn species from extinction. A short video offers one of many conservation success stories viewed on 100 plus inch displays found throughout the museum. Bob Ziehmer, Bass Pro Shops’ director of conservation, notes the museum’s videos and signs will yield valuable information for youth. “The children that come through here are gonna be the leaders, they’re gonna be the decision makers of tomorrow. And to help them understand and appreciate the resources and what sportsmen and women have done and are doing today is very important,” says Ziehmer. WOLF students Easton McCalhlan and Lilly Williams share with arctic exhibit visitors what they've learned about the polar bear. Lilly Williams is learning just that, along with some 45 other fifth-grade students enrolled in Springfield Public School’s WOLF program. It stands for Wonders of the Ozarks Learning Foundation and works in tandem with Wonders of Wildlife. The students were on hand during this week’s media tour to answer questions. For Williams, who setup in WOW’s arctic exhibit, she’s learned a lot about the polar bear claw. “It’s really interesting that just a bunch of things, that it’s shorter and sharper than the brown bear claw, it’s used for traction when polar bears are running or climbing on ice. And it’s thick, it’s curved and it’s non-retractable,” she says. The living creatures of this museum are mainly located in the aquarium section, which makes up about half the complex and is comprised of roughly 1.5 million gallons of water. That’s according to WOW Executive Director Mark Schafer. “Our total collection is over 35,000 representing 800 different species,” says Mark Schafer, executive director for WOW. Crawl under and then "pop-up" to get the 360-degree view from a tank as if you're inside. There are a handful located throughout the museum. So-called pop-up tanks allow children to crawl underneath and up through a short window for a 360-degree view. See aqua life of the Amazon like piranhas, come face to face with a goliath grouper weighing some 700 pounds, and witness a school of fish in the hundreds protect themselves from predators by swimming in what’s called a bait ball. There are exhibits dedicated to various species of sharks, river otters, bats, reptiles and more. Wonders of Wildlife is a collection of both immersive displays and honorary platforms. It plays host to the National Bass Fishing Hall of Fame and the International Game Fish Association’s Fishing Hall of Fame. Over 40 partners including the Missouri Department of Conservation and national groups like Ducks Unlimited and the Audubon Society have helped to form the museum’s collections and share in its educational message. Officials won’t give an exact figure of WOW’s costs, but say investments are on par with what it took to build the Georgia Aquarium in Atlanta, which had a total price tag of roughly $290 million. Step inside a replica bait and tackle room circa 1971, the Brown Derby Bass Pro Shop that started it all. Before entering WOW you’re invited to tour a small history museum celebrating the Bass Pro founder’s story. Step inside a replica bait and tackle room circa 1971, the Brown Derby Bass Pro Shop that started it all. “Wanted to bring everybody just a little trip down memory lane,” says Johnny Morris, as he’s shown in a video pulling his truck up to the site of his father’s former liquor store at 3543 S. Campbell. For 13 years it served as the home for Bass Pro, which now operates 95 big box locations nationwide and is expected to finalize a deal this year to acquire outdoor competitor Cabela’s. Throughout the exhibit, view tributes to conservation pioneers, including Native Americans, Lewis and Clark and President Teddy Roosevelt. On Wednesday, conservation leaders of today gathered in Springfield for the museum’s ribbon cutting. It included former presidents George W. Bush and Jimmy Carter, Academy Award winning actor Kevin Costner, and country music stars. “Thank you everybody for being here tonight,” Morris said to a standing ovation before thousands of invited guests. Morris (middle) cuts the ribbon at a ceremony Wednesday night. He was joined by former Presidents Jimmy Carter, George W. Bush, and Academy Award winning actor Kevin Costner, among others. Wonders of Wildlife opened in 2001, but closed in 2007 because, according to Rob Keck, Morris didn’t think it was “Grand enough.” 10 years later and at least double its previous size, after numerous delays and project extensions; Morris appears to be satisfied. 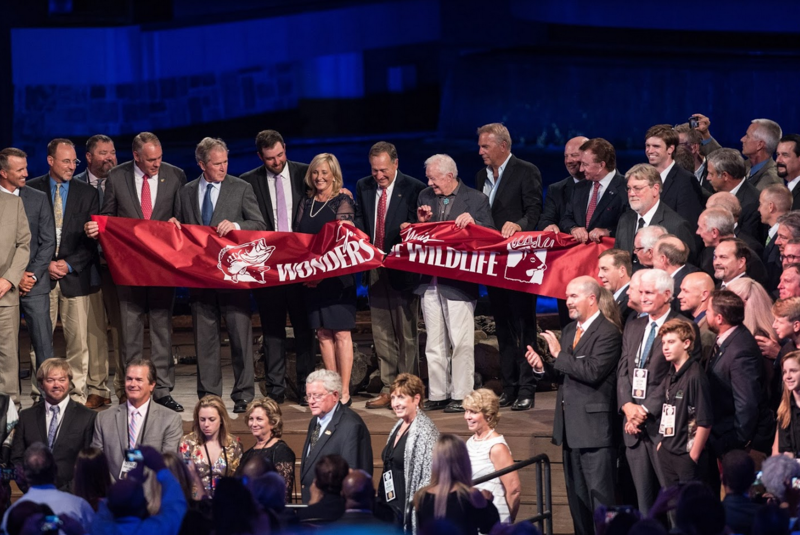 But Wednesday’s event wasn’t just to celebrate the Wonders of Wildlife opening as it was, according to Morris, intended to honor conservationists. WOW opens to the public Friday at 10 am. Ticket information can be found here. Initially, tickets will be sold on a timed-entry basis to prevent overcrowding and long lines. Antitrust regulators have signed off on Springfield-based Bass Pro Shops’ $4 billion acquisition of fellow hunting-fishing outfitter Cabela’s. Cabela’s, based in Nebraska, said Wednesday the Federal Trade Commission had ended its investigation into the deal earlier this week.